Our students have very diverse interests, but there are aspects of the PhD program, beyond their interest in Astronomy and Space Science research, that are common to them all: a Special Committee to guide them, courses to help broaden their knowledge, opportunities to get teaching experience, formal assessment throughout the program and that we solicit their feedback, and input, to help ensure the program is a success. If you enter the Astronomy and Space Sciences graduate program, you are not required to declare a research focus. While some already have a strong opinion about where they want to focus their attention, many students come into our program not yet knowing which research area they want to pursue. We place great importance on our students using their first two years of study to gain a broad foundation of knowledge and to explore the range of research opportunities within the department, to decide their path for thesis study. 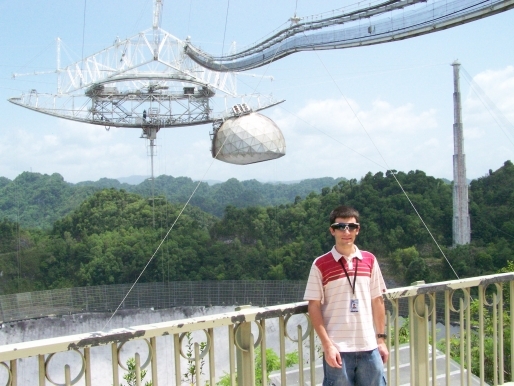 Irrespective of our students’ chosen paths, the goal of our program is to produce excellent scientists with the skills required to conduct and effectively communicate world-class scientific research, who have a deep underlying knowledge of Astronomy, and an understanding of how their research connects into the broader Astronomy community and related fields. Each graduate student in the Field of Astronomy and Space Sciences works with a committee of graduate faculty members called their Special Committee to define a program of study and research tailored to their personal needs. For the first year, each student's Special Committee is assigned to be the so-called First Year Committee, an annually-rotating body of faculty members who have been chosen to reflect the principal fields of research within the Department of Astronomy. Near the end of the first year and beginning of the second year, each student chooses their own permanent Special Committee in concert with the Director of Graduate Studies (DGS). This typically has 4 members and is chaired by their intended thesis advisor. There are 3 formal assessments of graduate students given by their Special Committee. The first is the Field’s “Qualifying” or Q-exam held at the end of the first year. This is a diagnostic test, with a written and oral component, which in combination with course grades helps the Committee to ensure that each student is progressing well, and identifies any weaknesses that need to be addressed. Please note, the Q-exam is not used to whittle down the class size, as is rumored to happen at some institutions. We have always admitted students to the program with the full expectation they will be supported through to their PhD. The Graduate School requires two formal assessments of graduate students: the A-exam, typically taken in the 6th semester, and the B-exam, at graduation. The A-exam is an oral exam that is used by the Special Committee to assess if a student has the necessary breadth and depth of knowledge of the field, and suitable research plans, to proceed with their PhD thesis in earnest. The B-exam is where the students present, and defend, their thesis to their Special Committee. Often graduating students in our Department opt to give a public seminar on their thesis topic immediately prior to their B-exam. Students typically graduate in their 5th or 6th year. As part of the program we also have students and their advisors do internal reviews each year and we provide the students with an informal self-assessment list to help them develop the skills they need. Neither the Graduate Field of Astronomy nor Cornell’s Graduate School require students to take a specific set, or number of courses. Students do usually take courses, however, (typically ~ 6 per year) in their first two years to gain the breadth of knowledge in physics and astronomy, and depth of knowledge appropriate to their planned specialization, to meet the requirements of the ‘Q’ and ‘A’ exams. Astronomy is a highly multidisciplinary field, and involves widely varying research from instrumentation to theory. The specific courses selected by a graduate student will reflect their particular academic background and research goals and are made in consultation with their Special Committee. This can often include courses in other departments at Cornell. While first year graduate students focus primarily on courses, they also gain experience in research, using it as a way to explore research opportunities. Many students undertake research during the academic semesters of their first year and all students are required to undertake a full-time research project in May-August preceding the start of their second year. Their performance in their research project forms part of the ‘Q’ exam assessment made by the First Year Committee. During the first semester of the second year all students are expected to begin research in a formalized way, to find a research advisor, and form a Special Committee with their intended advisor as its Chair. The Field of Astronomy and Space Sciences admits only as many graduate students as it anticipates being able to support through their Ph.D. First year students are supported through University and external Fellowships, and Teaching Assistantships. From the second or third year of study it is typical that students are supported as a faculty member’s research assistants. The financial support typically includes salary, tuition waiver and health benefits. Most, if not all, graduate students gain teaching experience while in the PhD program, typically through teaching assistantships during their first two years. We strongly encourage all students to teach at some point during their PhD as it provides valuable experience in communicating science, thinking on your feet (providing at-the-board “back of the envelope" arguments) and lesson planning that is invaluable throughout a scientist's career. Typically all of the students in the Field are supported through research grants and fellowships after the two years in the program. Students particularly interested in teaching have opportunities to gain further experience. For example one recent graduate was awarded fellowship to develop and teach her own course through the Cornell Knight Institute for Writing in the Disciplines, for which 250 students signed up for only 17 slots! Student feedback and statistics on the success of our students, as they progress through the program, are important to ensure the program best meets our students' needs. The DGS meets with the graduate students, to get their input and feedback, both in small groups, and as a whole, throughout the academic year. As a program, we also assess if our efforts to attract women and minorities are being successful, and whether we are successful in guiding our students through to a PhD.